Yesterday was my friend Pete’s 50th birthday celebration, and when I insisted on making him a cake. He joked he would like a bacon flavored cake. Well since I aim to please, this is what I came up with. I am no stranger to dark chocolate or bacon for that matter, so this cake was not a stretch for me. I toyed with the idea of adding bacon throughout, but feared not everyone would have the same fondness for a bacon and chocolate combo, so I decided a dusting on the top would suffice. I used the Chocolate Birthday Cake recipe from Paleo Spirit and it is fabulous! Made with coconut flour and in this case 18 eggs, (it was a 10 inch cake). It has a great sponge cake consistency with a fine crumb, and just the right amount of rich chocolate taste. Not to mention a lot of protein with all those organic eggs my own girls laid. I torted the layers and filled them with my standard frosting of whipped cream and cream cheese. Then I topped it off with some very fine dark chocolate ganache. WARNING: if you are not a fan of chocolate don’t try this at home. I was very pleased with the results, but alas I am a die-hard dark chocolate addict fan. 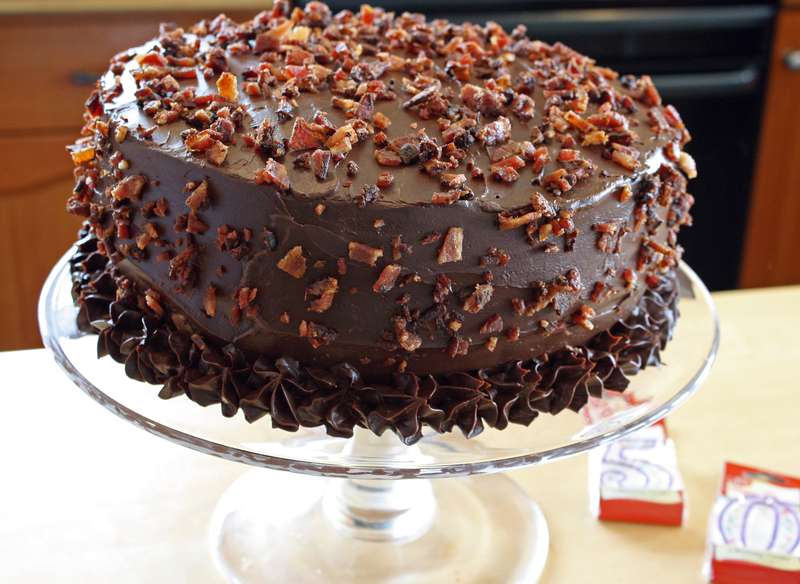 If you are like-minded, give this cake a whirl for any special occasion with or without the bacon on top. It will not disappoint, and for all its decadence and richness, it has relatively little sugar and no gluten, your flour eating friends will never guess it is gluten-free. In a large bowl whip the cream until there are firm peaks. Add the vanilla and maple syrup to the cream cheese and blend in until fully incorporated. Add the cream cheese mixture to the whipped cream and mix again until all is fully incorporated and you have a firm creamy frosting. This will fill the layers of a torted 10 inch cake. You can half the recipe for a 6 inch cake. It will also frost the outside of a 9 inch cake if you opt out of a chocolate ganache frosting. This is a very easy frosting and the sweetness is of personal preference. Heat the cream until just before a boil. Chop the chocolate up and add to a bowl. Add half the cream to the chocolate and let sit a minute before gently stirring, being careful not to let air get into the chocolate. Reheat the cream gently and add to the rest to the chocolate make sure all the chocolate is melted and the cream is fully mixed in. Let the ganache sit until it cools and reaches room temperature at this point you can use it to frost the outside of your cake. (If it seems to runny let it cool for a bit longer). This will frost the outside of a 10 inch cake. You can cut the recipe in half if you are making a smaller cake or to fill the layers of a cake too.